I love Italian food and I love Pasta! Who doesn't love pasta? I love getting the Ziti from Olive Garden, but I very seldom get to get it. The closest Olive Garden to us is over an hour away, so I don't get to go as often as I would like. However, I can make my own Ziti at home and it is actually pretty tasty. It's super easy too if you own an Instant Pot. You can also make it on the stove and it's just as delicious. 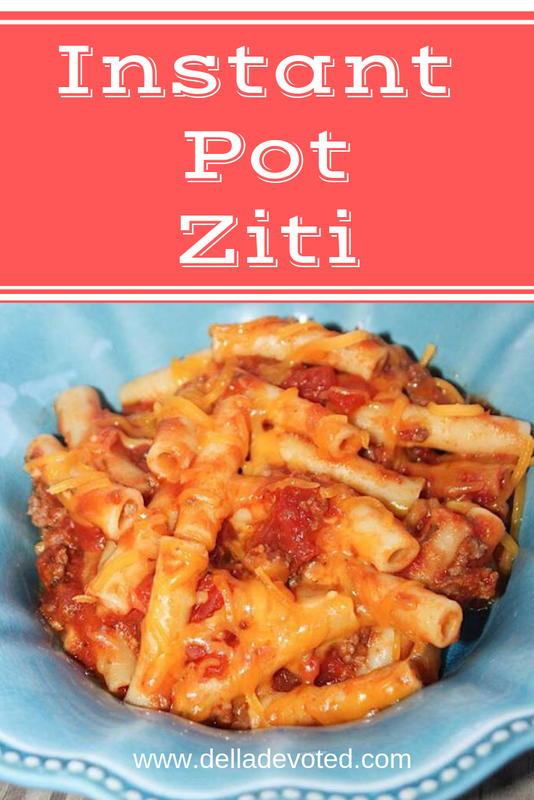 My husband and I prefer this Ziti over Spaghetti any day, and I have a feeling you will too. 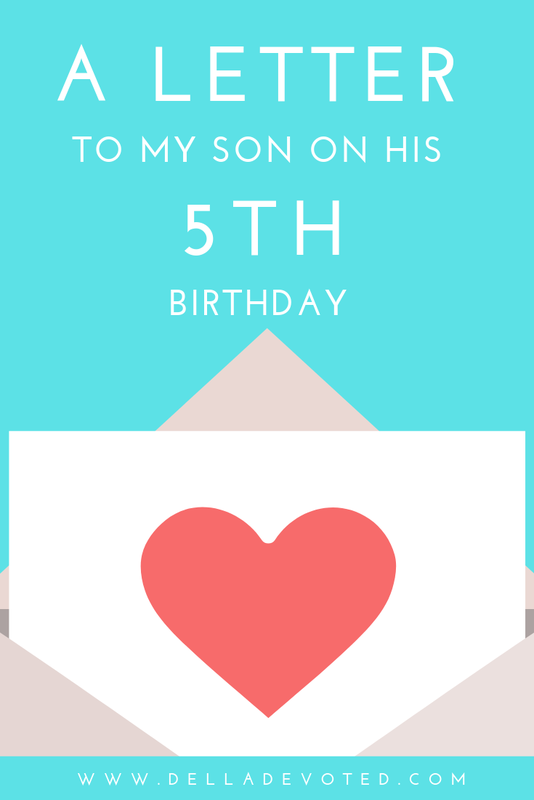 Last week, my son Raylan turned the big 5 years old. I made sure to do a whole day full of fun-filled activities and themes relating to his birthday. That's when this idea struck me. Why not do a birthday interview? It's something that I could put in a safe place to keep and reflect back on years later. It's also a way to remember how sweet he was at the tender age of 5 and remember how precious his answers were. It's actually an Interview that you can ask your child the same questions at every birthday and see just how much their answers have changed within a years time. I had so much fun asking Raylan these questions and hearing his sweet answers. It really was a precious memory for me that I will always treasure and something that I will look forward to doing every year. 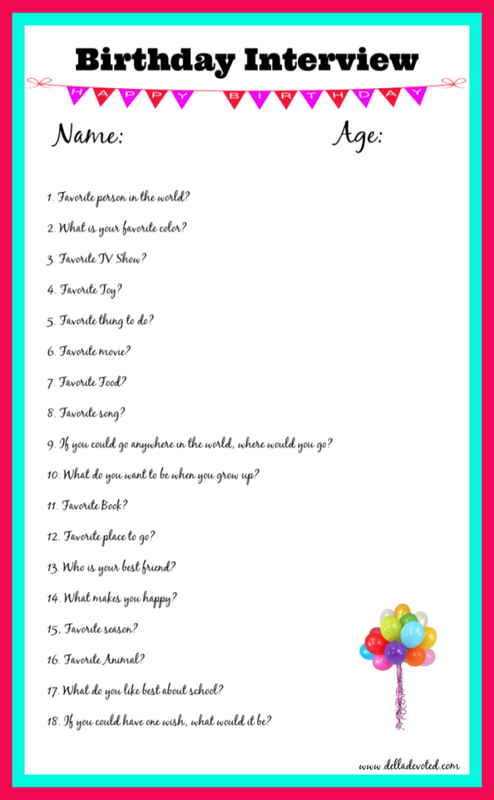 So I have put together a FREE printable birthday interview template that you can use to interview your child on his or her birthday. 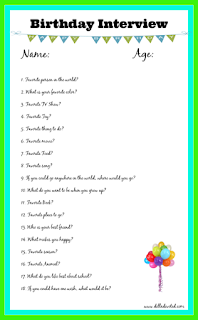 Below are FREE printable copies for a boy interview and a girl interview. Be sure to click on the proper link, print them out and begin making fun birthday memories with your child. These are wonderful keepsakes to look back on years from now and see your child's changing answers and personalities as they grow into an adult. Have fun making lots of Birthday Memories! I hope everyone had a great week. Unfortunately, my week wasn't much better than last week. After having the flu, I also caught the terrible stomach bug so it's been a pretty rough week and a half for me. The flu is going around bad here in Ky. They even cancelled school this week because of it. Hopefully they can sanitize the schools good and everyone can start feeling better soon. It's also been a good week because Raylan celebrated his 5th birthday on Wednesday. He said he wished to not have to go to school on his birthday and his wish came true. Here are 5 of my favorite photos of him for his 5th birthday. 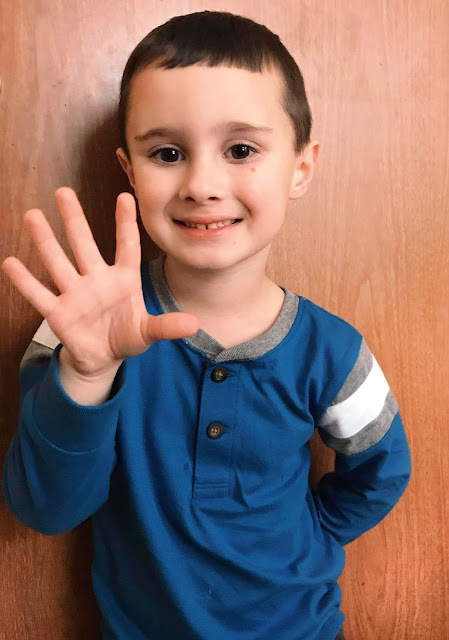 1) He was so excited to tell everyone that he had turned 5. 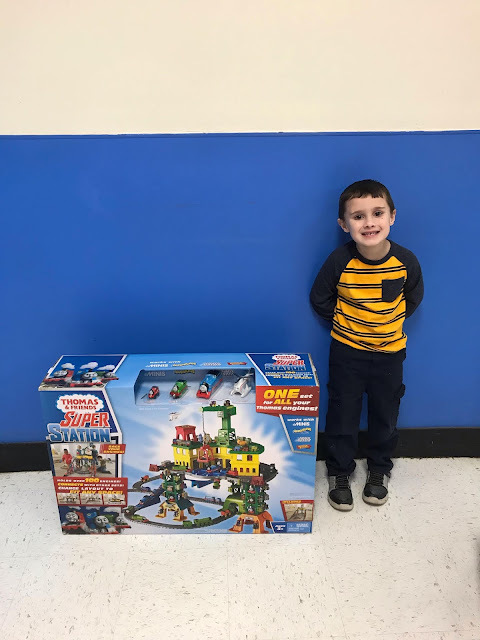 He woke up and thought he had grown much taller and stronger overnight since he had turned 5. He has made sure to tell everyone that he is now 5. 2) I was still recovering from my all of my sicknesses and his birthday was a very rainy day, but we still celebrated at home with cake and pizza. 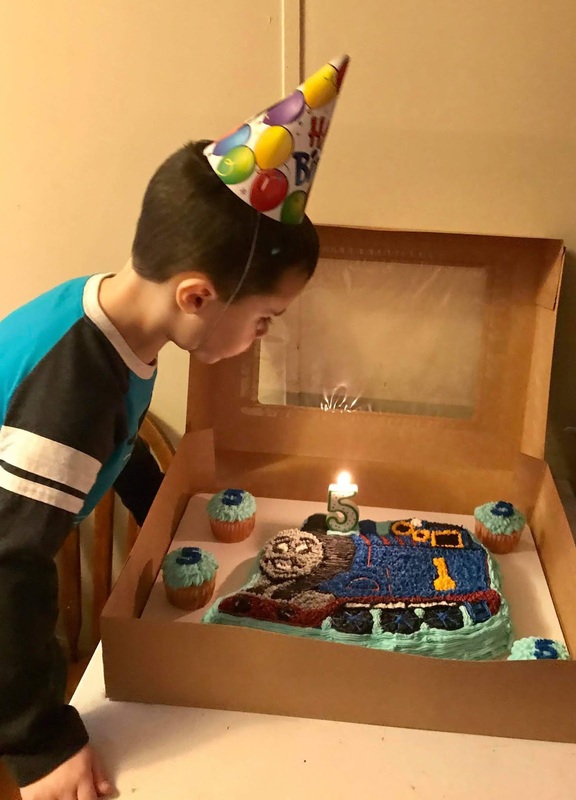 He loves Thomas the Train and had requested a Thomas the Train cake this year. 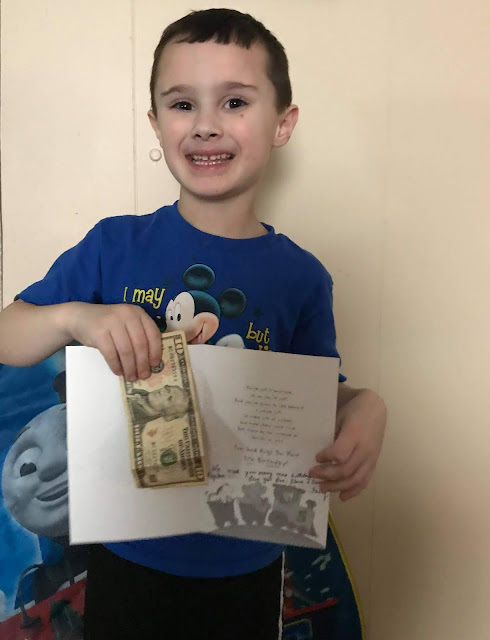 3) A long time family friend of ours mailed him a birthday card with some money and he was ecstatic that he had mail and money. 4) Our neighbor is such a crafty lady. 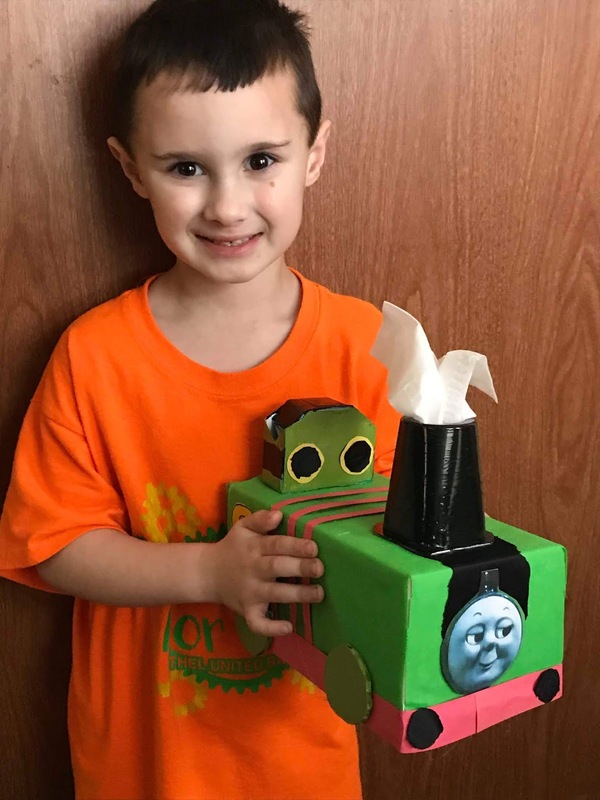 She made him Percy from Thomas and Friends out of a Kleenex box, construction paper and other items she had laying around. Raylan was in love with it and now has it displayed on his bedroom dresser. 5) This photo was taken back in January, but the only thing he asked for his birthday was this Thomas the Train Super Station. He said he didn't even want a big birthday party. All he wanted was this Super Station. I must say it has been one of the best gifts we have ever gotten him. He has definitely played with it more than any of his other toys. Yes, we let him have his birthday present almost a month early. However, we did get him a few small gifts to open on his actual birthday. Today is your 5th Birthday. 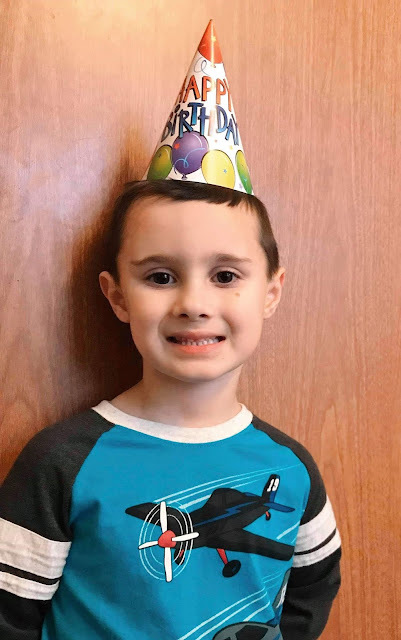 Happy Birthday my sweet sweet son! Every year on your birthday, I look back at all of the photos I have of you, and I cry. Some are sad tears because you are growing up entirely way too fast and it breaks my heart. I wish I could keep my tiny baby little forever. However, the tears are mostly happy tears. I am just so thankful that God blessed me to be your mom. 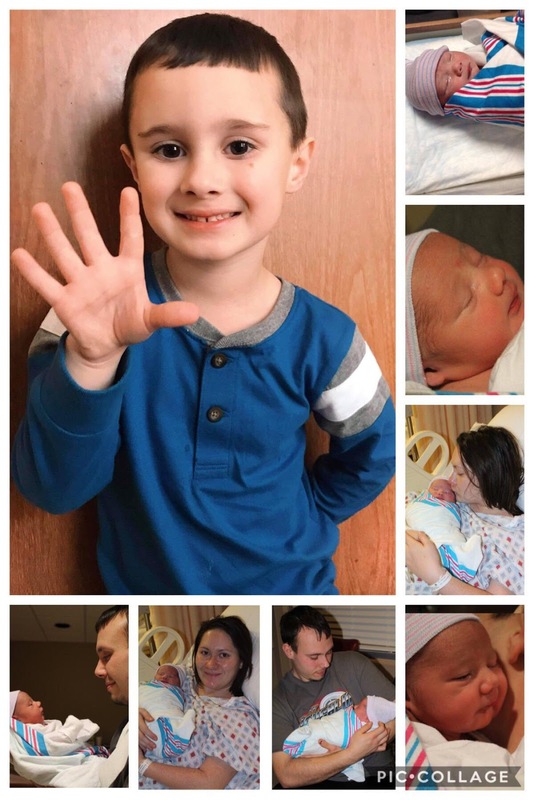 Somehow, in the blink of an eye, you have gone from a 7 lb 3 oz newborn to a 5 year old boy. I love watching you grow! Your dad and I are so very proud of you and all that you have accomplished in just 5 short years. You are more than half way through your first year of Head Start. You have already learned so much. I truly am amazed at how much knowledge that you hold inside. I love how you have come out of your shell in this last year and became your own little independent person. I also love the fact that you are making new friends and how you love school. I hope you never lose your love of learning. I love your wittiness and how you love to tell jokes. One of my favorite things about you at this age is your love for Jesus and church. Right now every night we read the 23rd Psalm and you have it memorized. That is just so precious to me. I pray that you always hold Jesus close to your heart and never let him go. Please never lose your love for Jesus and your love of going to church. On your birthday, I want to tell you how incredibly blessed we are to have you. You truly are the sweetest, most caring, and loving little boy. I love what a big heart you have and how you love to help others. On a daily basis, you do kind things to help your friends and family. You showed me this at Christmas when you wanted to help one of your friends that was in need. You also have a fiesty side to you too that I love. It lets me know that you are going to stand your ground and not let others run over you. Your dad and I love every single thing about you and we wouldn't change you for the world. However, we would change this cruel world for you. Please don't ever change who you are and don't let anyone try to change you. You are exactly who God created you to be. I love the love that you have for your momma and I pray that never changes. The hugs and cuddles may get fewer and far between because you are growing up, but my love for you will never change. No matter how old you get, you will always be mommy's little boy. In me you will always have a safe place. A place where you can always be yourself. I will be here to listen when you need to talk, hold your hand, and wipe those tears away. I hope and pray that I can always be the mom that you need me to be. You are my biggest blessing and my greatest accomplishment in this life. To me, you are perfect. I will always cheer you on and be on your side. I am so very proud to be your mom. Happy 5th birthday my sweet boy! I hope you have a blessed day! I hope you all had a wonderful Valentine's Day. There was no date night for us because I was fighting the Flu but my husband still made sure I had a great day. My husband was also sick, so we spent our Valentine's evening at home watching Netflix, munching on Valentine's candy and delicious cheesecake filled strawberries and chocolate covered strawberries that my husband got me for Valentine's Day. It might not have been the ideal date for some, but you can make the best out of any circumstance and to me it meant the world. So that inspired me to write this blog post. When we think of Date Nights, we almost always think of a romantic dinner and a movie. 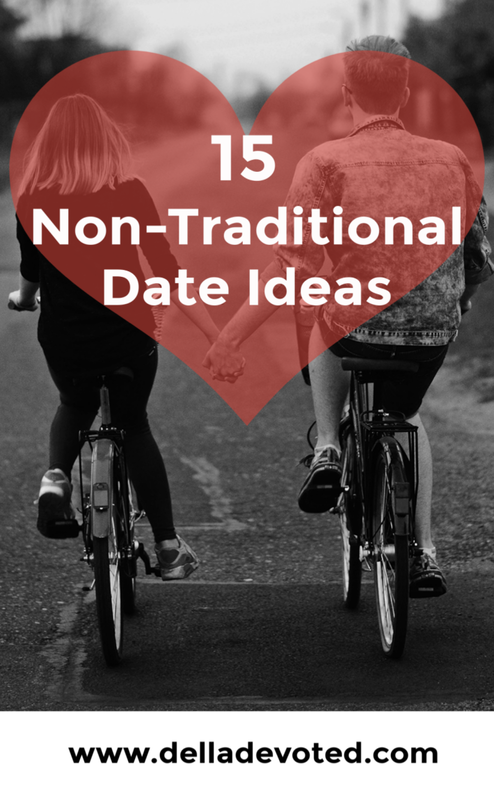 However, there are many Non-Traditional Ways to enjoy a date night with your partner. Some of these are weather permitting of course. 1) Date Night at Home- One of my favorite ways to spend time with my husband is by staying home, cooking a quick meal or maybe even getting takeout instead, curling up on the couch together and watching Netflix. It is spending good quality time together, with no rush and no where to have to go. 2) Church Dates- Ask your partner to attend church with you. My husband doesn't go to church that often with me, but when he does it absolutely makes my day. 4) Gun Range- My husband loves to Target shoot and I enjoy shooting with him. This is something we really bond together with. 6) Go to the Racetrack- My husband is a race car driver so most of our summer dates are spent at the race track. I hope everyone had a wonderful Valentine's Day! I have been under the weather all week. I was diagnosed with the Flu on Monday, so it's been a rough week. However, my sweet little family made sure I had a great Valentine's Day even though I still felt bad. Here are my favorites from this past week. 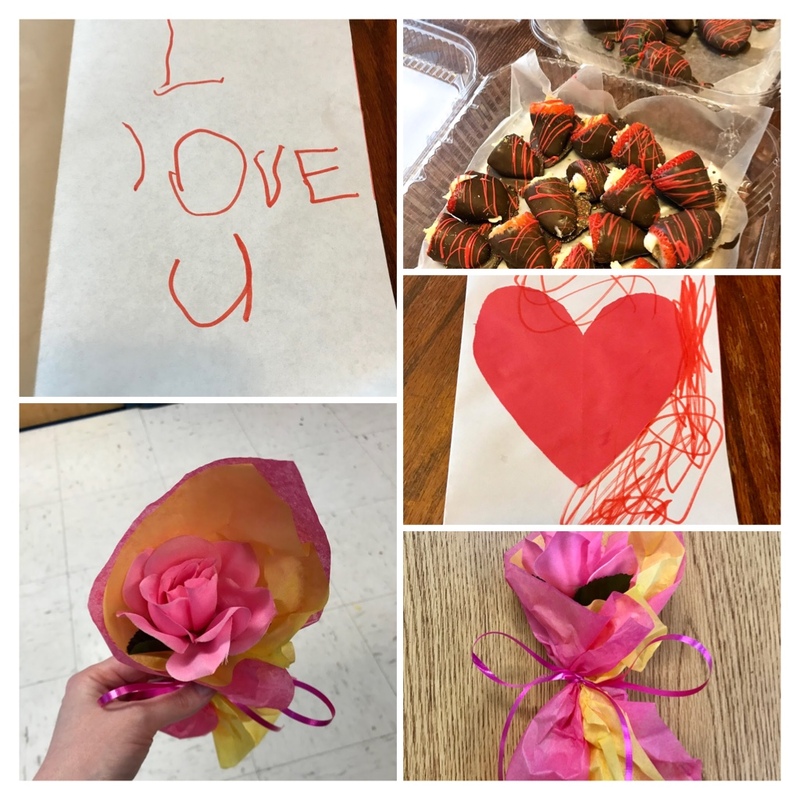 1) Raylan made me this adorable homemade card in his class and bought me this beautiful rose at school for Valentine's Day. My little guy is so sweet and so thoughtful. I love this age that he's at now. He's just so precious! 2) On Saturday, Justin ordered take out from our local Giovanni's. They have this amazing Philly Cheesesteak Wedge and it's so good. If your local Giovanni's has one you must try it. 3) Our dog Roscoe went missing, but thankfully with the help of Facebook and some very sweet people we got him back. He had gotten with some other dogs and had gotten lost. Someone ended up taking him to our local animal shelter. I'm so thankful he was taken there and was safe and someone located him for us. Raylan is so happy to have his dog back and so are we. Roscoe has been in our family since Raylan was a year old. 4) I was too sick and had way too many germs to get to attend Raylan's Valentine's party. It really bothered me to have to miss. I've never missed any of his events or parties until now. I'm so thankful Raylan has an awesome Teacher and awesome teacher's aides. They sent me several photos of him having a wonderful time and that eased my mind. I love seeing my baby happy and enjoying himself. 5) Justin and Raylan got me two and a half dozen of cheesecake filled strawberries and chocolate covered strawberries. Justin knows that they are my absolute favorite and he knows that food is the way to my heart lol. My dad got me a huge box of chocolates too. So my sweet family made sure I had a great Valentine's Day.